For around a month the Large Yellow Underwing has been the commonest species in my moth trap – their numbers are now diminishing and the commonest species now is the Common Wasp (Vespula vulgaris). And by the morning they all seem to have been attracted by the light and are in my moth trap. 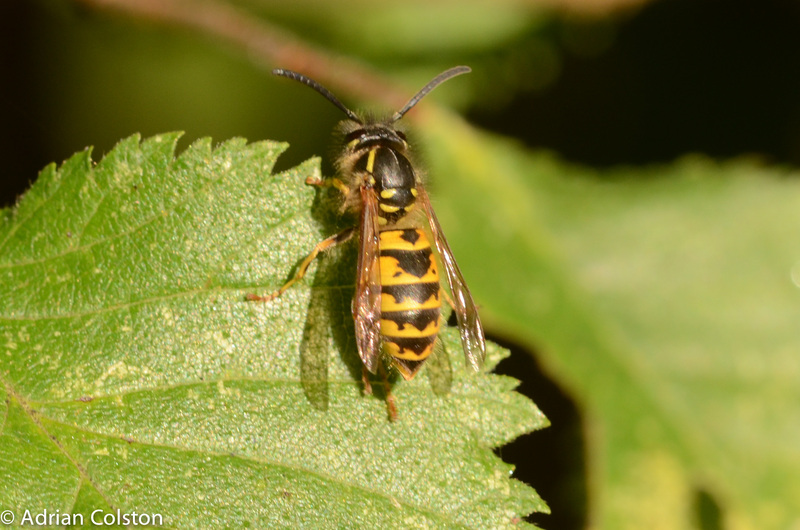 My friend and colleague Matthew Oates recently circulated the following note about Asian Hornets – I thought I would reproduce it in full here. Asian Hornet poses no threat to humans – unless you disturb a nest, which are usually in trees but can be in sheds, garages etc. Hornets are not attracted to jam, cream, scones, cake etc., NT tea gardens, or people. They don’t like wasps, which are probably the honey bee’s number one enemy – and may do more good than harm to honeybees as a result. 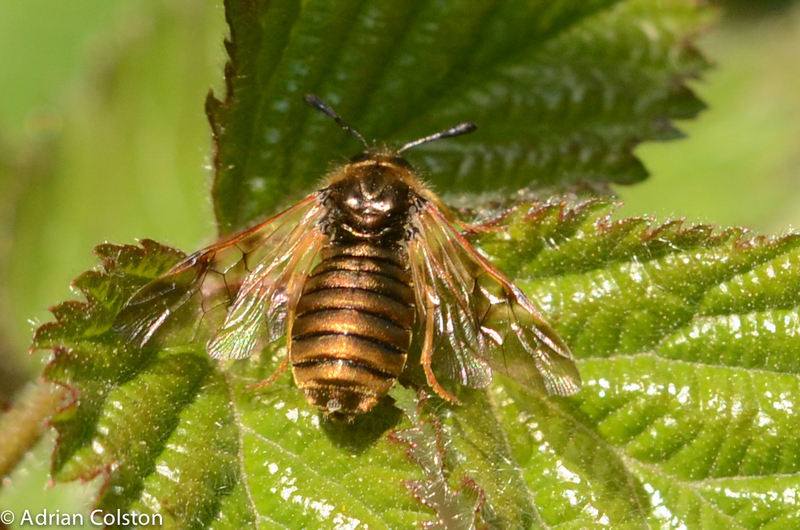 Experts within BWARS (the Bees, Wasps & Ants Recording Scheme) feel strongly that the Asian Hornet is unlikely to pose a major threat to honey bees here, or to any other element of our wildlife. Neonicotinoids pose a far greater threat to bees and other pollinating insects. 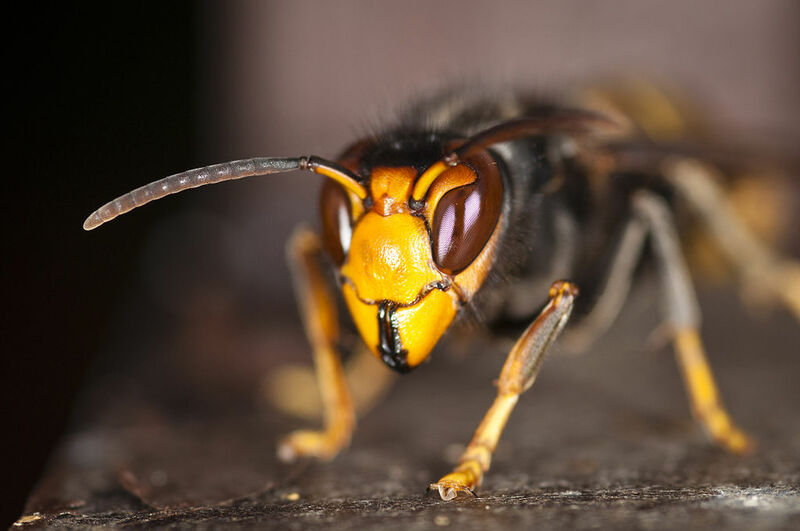 Nonetheless, when Asian Hornet arrives there will be an almighty panic, as Defra – primed by bee keepers and pest control companies – will spring into action. Certainly, knocking out colonies at an early stage may delay the insect’s establishment here for a while. Eventually, we will learn to live with the Asian Hornet. 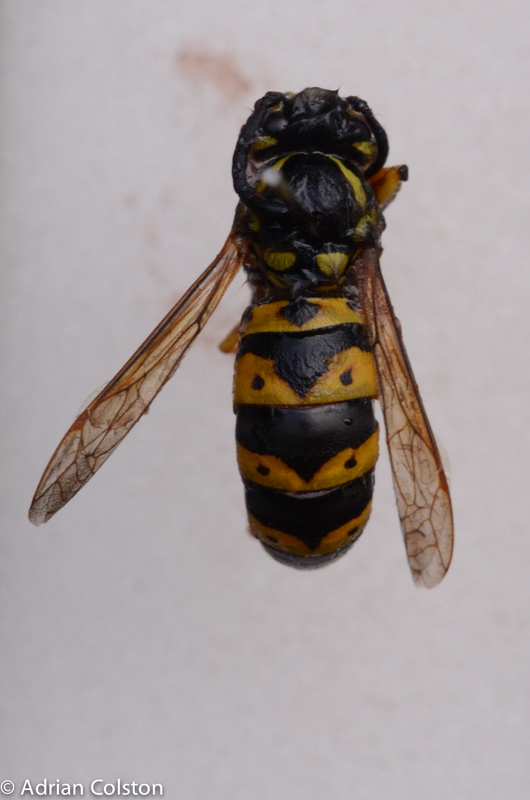 BWARS have had to deal with over 400 misidentifications of Asian Hornets! 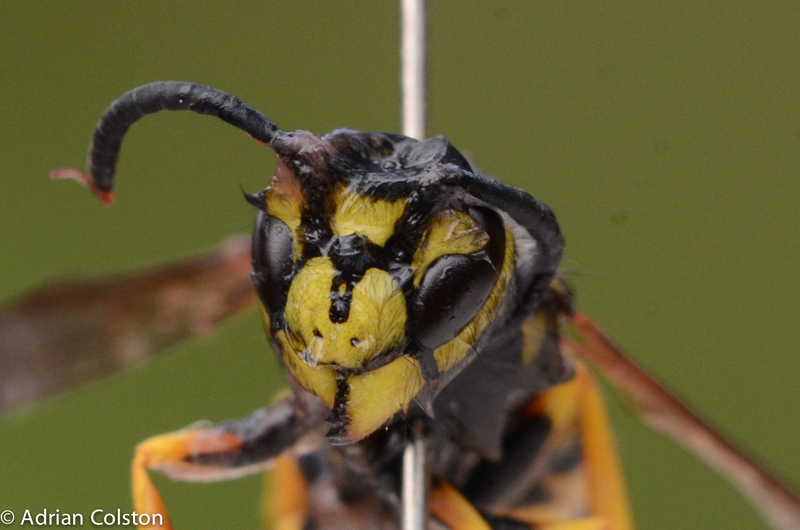 This has been a good or a bad year for wasps depending on how you quantify it! Many catering outlets around the Region have been plagued by wasps and some have got quite desperate. 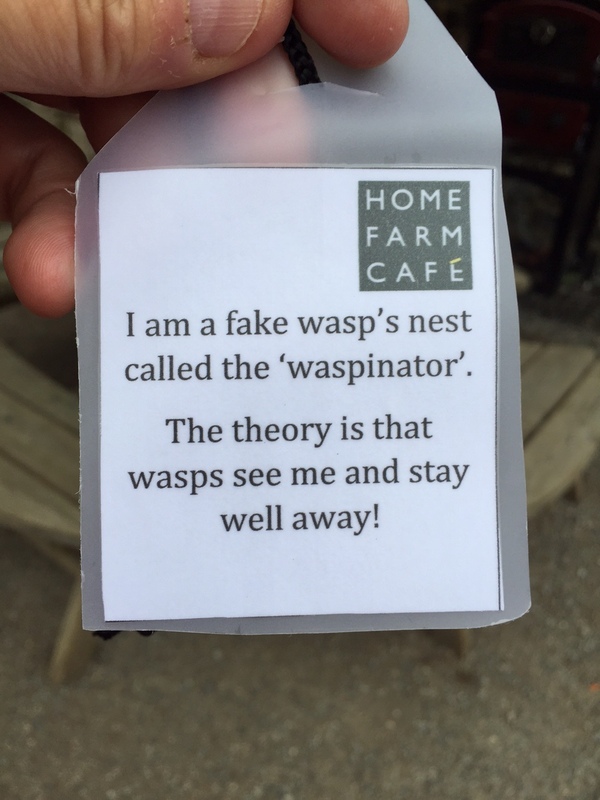 At Home Farm Cafe at Parke they have got on top of the problem by using wasp traps and the ‘waspinator’. 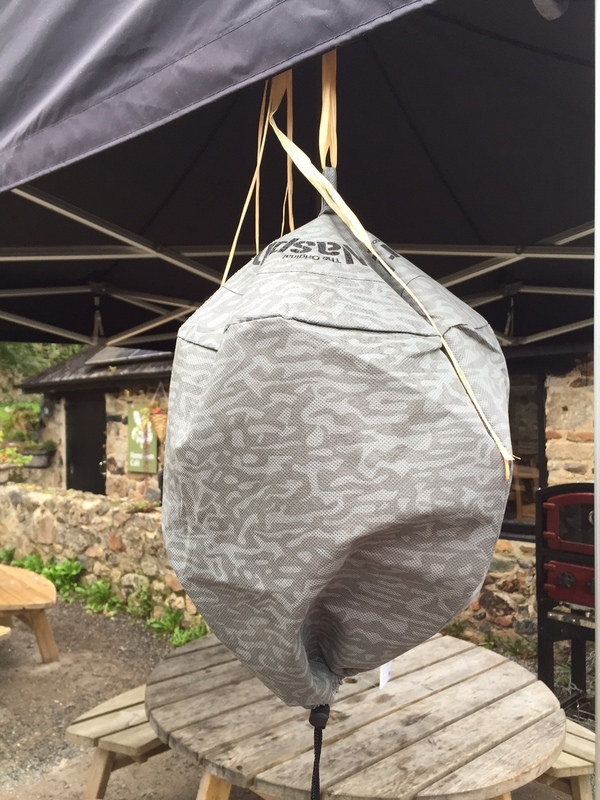 I like the idea of the waspinator as it is non lethal – the idea is that it looks like a wasps nest and therefore deters visiting wasps from the vicinity. 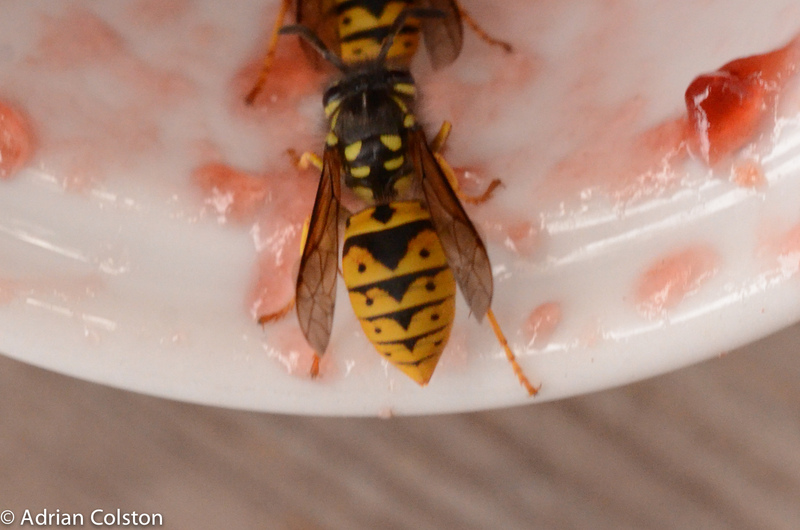 Wasps are so intent on eating jam that they don’t take their personal safety into account. Yesterday they were feeding on a couple of little pots of jam before the rain came …… the pots then filled up with water and dozens of them drowned whilst still eating the jam. They should be nominated for the Darwin Awards! 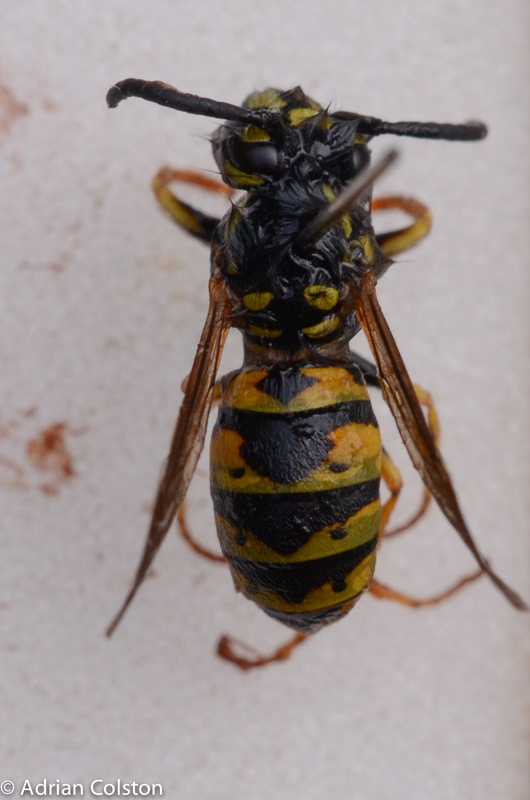 As a result I managed to collect a few dead specimens to get some better pictures of the German Wasp which I photographed a few days ago and also found some individuals of the Common Wasp (Vespula vulgaris). This is the body pattern – note four yellow spots on the thorax (chest) and the large downward facing triangle on the abdomen along with 3 pairs of black spots – a common species. 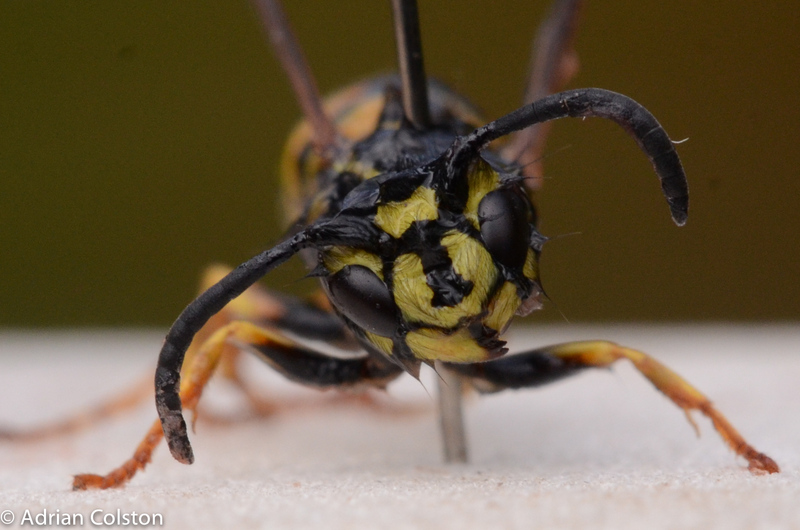 The body of the German wasp – 4 yellow marks on the thorax (two are a bit hidden in this picture), a narrower downward facing triangle and the black dots. 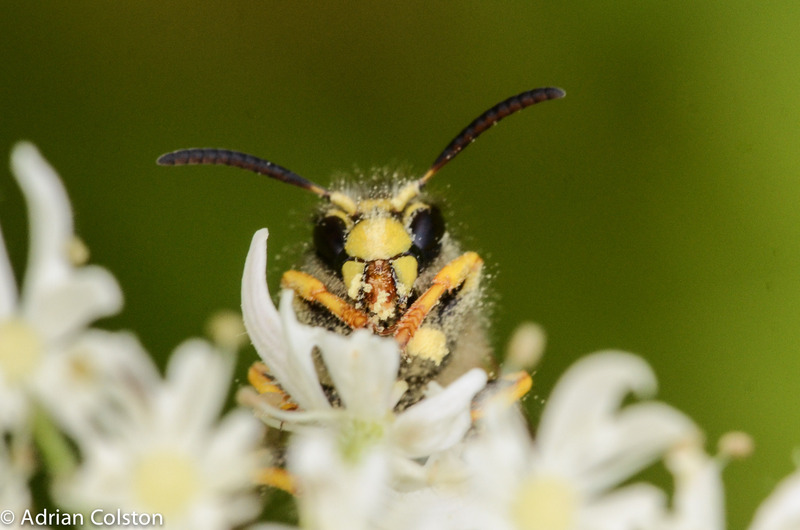 Continuing on this week’s theme – here is the German Wasp Vespula germanica. Everybody knows wasps like a cream tea! 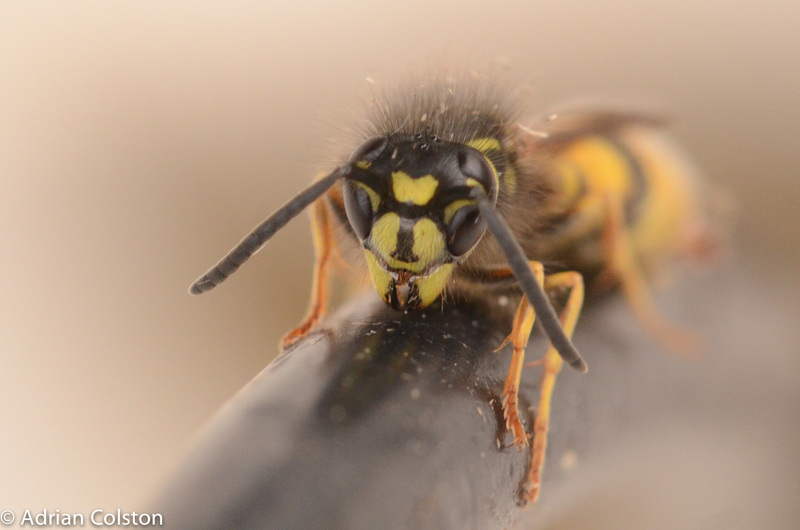 German wasp inspecting the jam – note 4 spots on the thorax (the chest) and 8 spots down the abdomen (back). 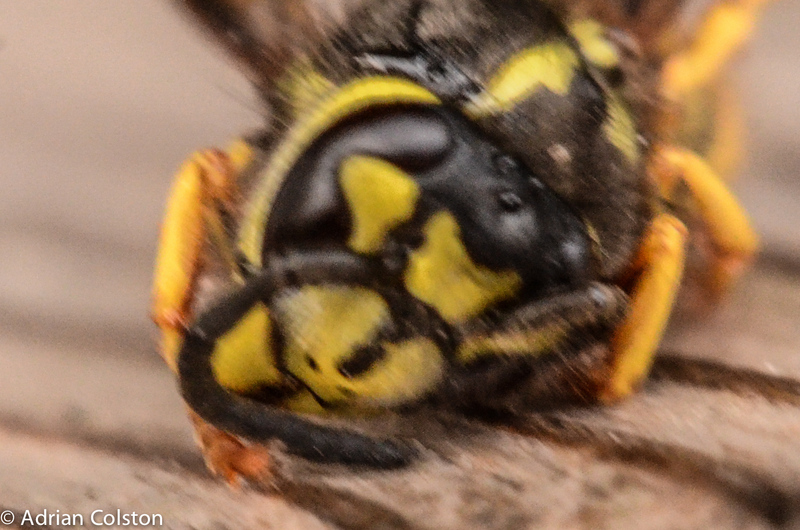 This is a very poor photo of the face of a German wasp – note the middle of the picture – a dark elongated blob at 45 degrees with two tiny small dots underneath – the distinguishing features of the face of the German wasp worker. Oddly according to the National Biodiversity Network map the German Wasp isn’t very common at all in Devon. We were interviewing at Finch Foundry yesterday for contractors to prepare our Conservation Management Plan for the property – I will write about this later and explain what it is all about! 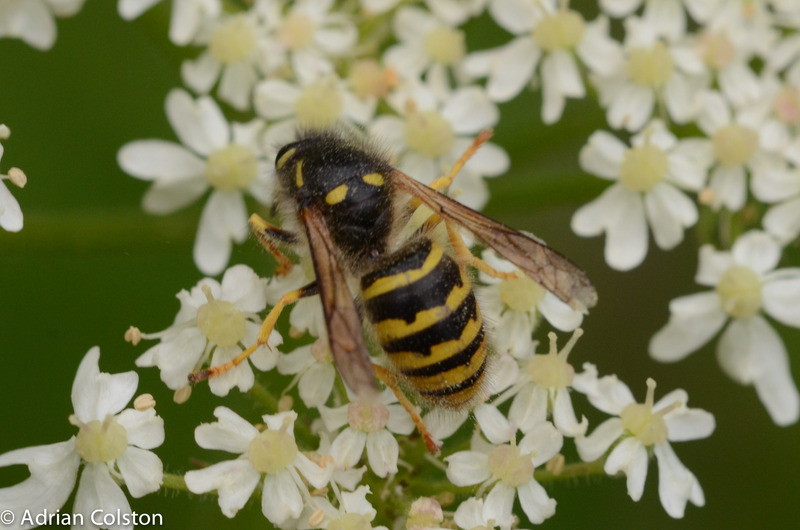 Before the ‘interviewees’ arrived I managed to take a few photographs of a wasp munching away on a hogweed flower. The patterns on the abdomen are different, there are only two yellow spots on the thorax and there are no areas of red anywhere. Also note how hairy the thorax (the bit with the two yellow spots) is. 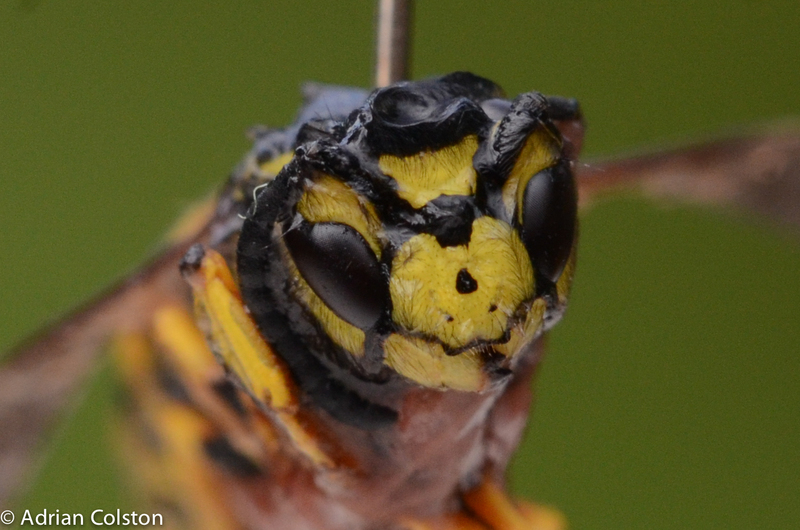 Here is the face of the Tree Wasp – there is no red ‘dagger’ on the yellow patch between the eyes. Some tree wasps do have a small back spot but this one doesn’t. 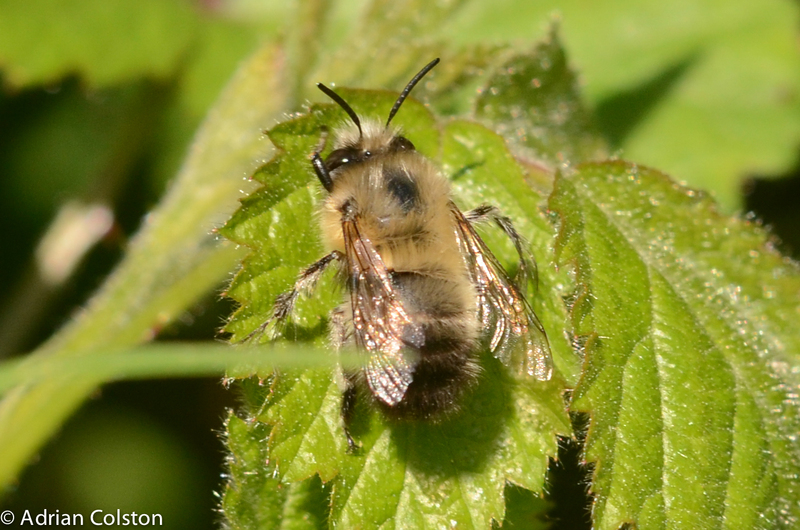 You can also again see how hairy it is – lots of those hairs have got hogweed pollen on them.